Not only is Tubi TV easy to use, but you can also stream the service through Kodi. 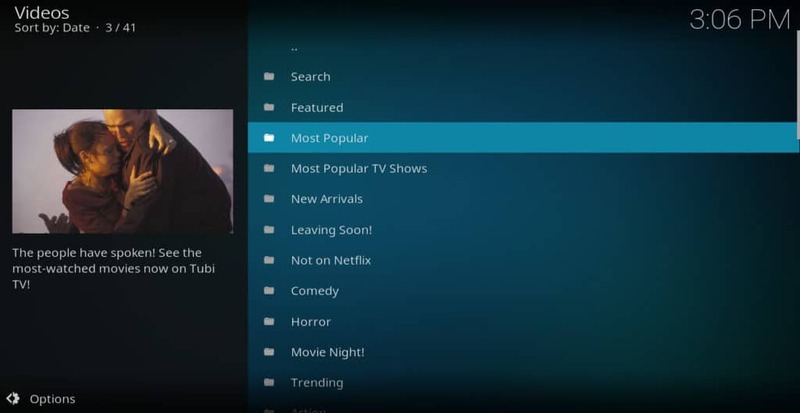 Below, we’ve laid out where to find the Tubi TV Kodi addon and how to get the addon setup and working on any Kodi device. If you’re willing to pay for streaming-video sites like Netflix and Hulu, you can get a lot of quality content. But many people don’t realize there is often good content available for free as well. Tubi TV has past seasons of popular cable TV shows and movies starring well-known actors, yet it is funded through advertising instead of a subscription fee. It also has the 4th largest content library of any streaming service in the U.S. Outside of the U.S., Tubi TV is also available in most other regions, including Canada and the U.K., although with varying content libraries. Tubi TV can be operated on its website, or through the free media player Kodi. Kodi can play many different file-types, including WMV, MPEG4, and AVI. 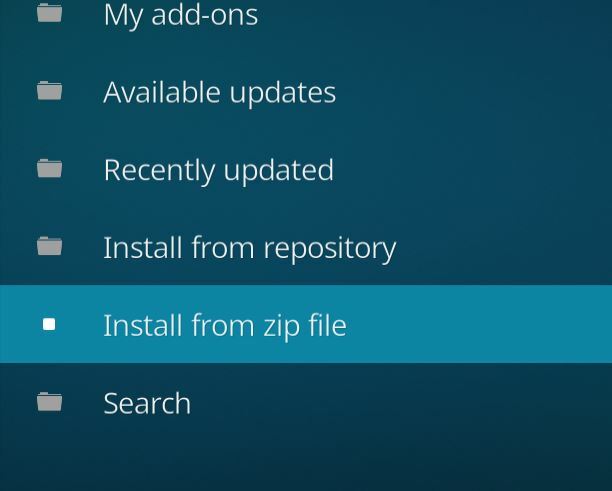 By installing addons, a user can employ Kodi to watch files contained on the Internet. It can be streamed to a Roku using an Android or iOS phone or installed on a PC or Apple TV. Kodi has developed a bad reputation in the media for being used in piracy. 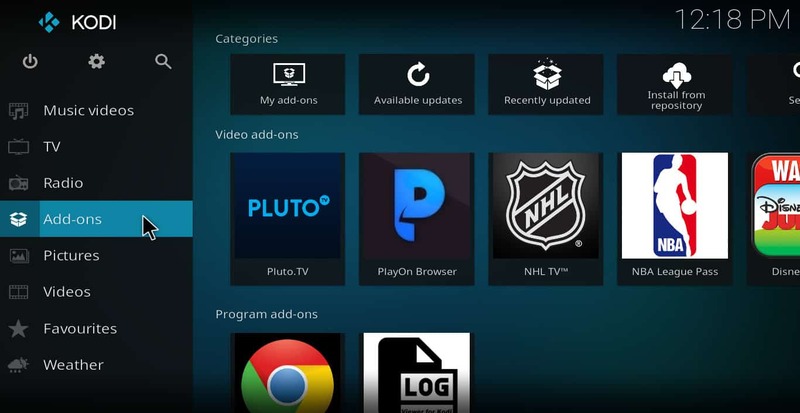 However, there are plenty of websites Kodi can access that stream videos legally, including Tubi TV. When people use Kodi to stream unlicensed content, they generally use a VPN to hide their activities. However, everyone who streams video can benefit from a VPN, regardless of what source they stream from. People who stream video can be harmed when ISPs slow down their speeds. ISPs do this in an effort to save money instead of paying to provide customers with more bandwidth. VPNs protect users from this threat by encrypting the data being received so that the ISP doesn’t know where it came from. As a result, VPNs often allow users to enjoy buffer-free videos. VPNs also protect users against Man in the Middle (MitM) attacks by hackers and help bypass geographic content-blocking by streaming sites, including Tubi TV. Some VPNs invade the privacy of users by keeping logs of their activities. Others have servers in only a few countries. For these reasons, we recommend IPVanish to Kodi users. 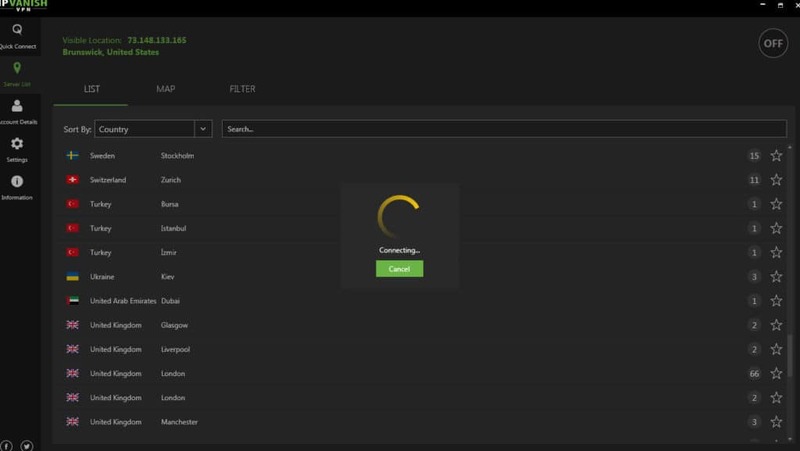 It has servers in over 60 different countries, keeps no logs, and is easy to install on the Amazon Fire Stick and Nvidia Shield. In our testing, we found that it streamed 1080p video with no buffering. For more VPN options see our article on the best VPNs for Kodi. Click Download ZIP. The file should be titled something like plugin.video.tubi-x.x.x. Remember where you save it. That’s it. 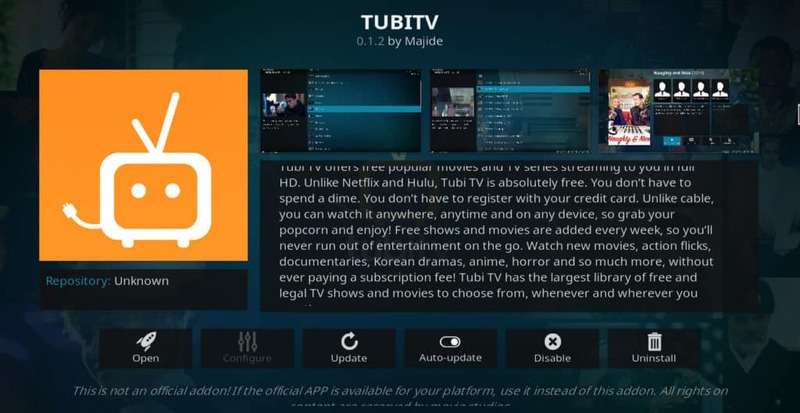 You now have the Tubi TV Kodi addon installed. The content on Tubi TV is divided into 41 different menu items. Each of these items has many different movies and/or shows within it. However, there are a lot of location-restricted titles on this platform, so what is available to you will vary according to where you are accessing the Internet from. The menu items and content listed below are for the U.S. market, which has the largest catalog. The first seven menu titles are Featured, Most popular, Most popular shows, New arrivals, Leaving soon, and Not on Netflix. The titles of these menu items are pretty self-explanatory. Here’s a rundown of the content provided by some of the others. This selection includes everything from teen comedies like High School Comedy (starring Sean Patrick Cannon and Jillian Murray) and Bart Got a Room to classics like Fatal Beauty (starring Whoopie Goldberg). This menu item contains a lot of very old horror movies from the 60’s and 70’s. You can find Attack of The Killer Tomatoes (1977) here, along with Black Sabbath (1963) and Black Sunday (1960). It also has some popular movies from the 2000’s like Rob Zombie’s House of a Thousand Corpses (2003) and both of the BloodRayne movies (2007). Using this option, you can find movies chosen for couples or groups of friends. It includes some romantic comedies, action movies, horror movies, and experimental films. The one thing all of these movies seem to have in common is that they all have highly-rated directors or writers. It includes the raunchy U.K. comedy The Inbetweeners, the 2013 remake of the Texas Chainsaw Massacre, and the classic drama 12 Angry Men, amongst many others. A selection of movies that are not yet popular enough to be put in the popular section but have been increasing in views lately can be found here. If you’ve already watched all the movies you want to from the popular and movie night sections, this is a place you can look to find a few that are hidden gems. If you’re in the mood for something fast-paced and exciting, there are a lot of quality films in the action section of Tubi TV. It includes a crime thriller starring Kurt Russel called Dark Blue and a spy movie starring Channing Tatum called Haywire, amongst many others. This is kind of a catch-all category that Tubi TV puts a lot of movies from other categories into. You can find Showgirls here, along with The Hot Spot, a classic bank-heist film starring Don Johnson and Jennifer Connolly. Some of the most popular films on Tubi TV are in the thrillers section, including Hard Candy (starring Patrick Wilson and Ellen Page), Dark Tide (a surfer movie starring Halle Berry), and Antitrust. On the Tubi TV website, the Playlists menu presents collections of films that have a common theme, such as “Halloween Horror,” “Most Disturbing Movies,” and “best Movies of the 2000’s.” Unfortunately, this feature does not work correctly on the Kodi addon. 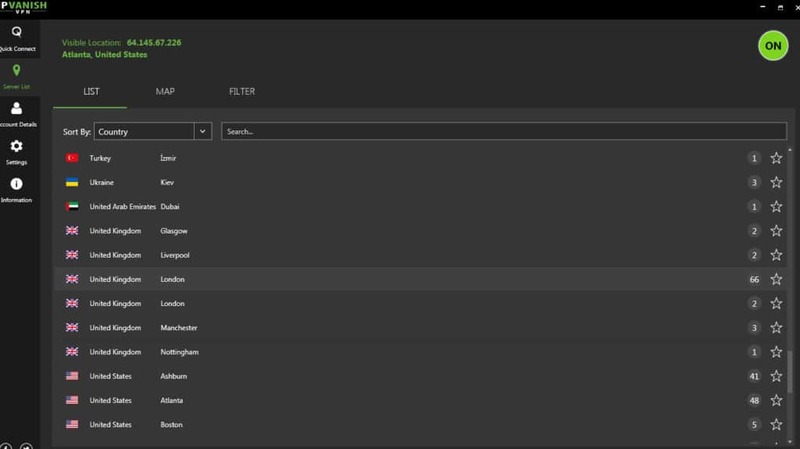 Instead of listing each collection as a separate menu, the addon simply combines all of the collections into one giant list of movies. If there’s a particular movie you see in a collection when browsing the website, you can quickly find it within Kodi using this menu. Otherwise, this section is useless to Kodi users. This section has a list of movies that both kids and parents tend to enjoy, such as All Dogs Go to Heaven, Trading Mom, and FRED: The Movie. Clicking this item opens a list of TV shows aimed at children, such as Mr. Bean, Wolf Blood, and H2O. Each series has its own folder, which makes it easy to find the particular episode your child wants to see. U.S. shows and movies featuring African American actors and producers are contained here. Pride (starring Terrence Howard and Bernie Mac), Akeelah and The Bee (starring Keke Palmer and Laurence Fishburne), and the crime drama Belly are notable titles in this collection. This section includes many popular sci-fi & fantasy shows like Merlin, Camelot, and the Dead Zone, as well as lesser-known dramas from other genres. If you like TV competitions and real-life stories, Tubi TV has multiple seasons of over 100 reality TV shows, including Dog: The Bounty Hunter, Storage Wars: Texas, and Fear Factor. Tubi TV contains over 60 anime titles, including well-known titles like Naruto, Yu-Gi-Oh, Deathnote, and Bleach. All of them are subtitled. Unfortunately for users who prefer it, Tubi TV does not offer dubbed anime. As the name implies, this section lumps together all of the movies available on Tubi TV that have high ratings on Rotten Tomatoes. If you want to find something to watch quickly, this is yet another menu item that can help you make a decision. As stated earlier, there are a lot of region-restricted titles on Tubi TV. For example, if you currently access Tubi TV from a location in the U.S., you’ll see films like The Last Stand, Joe, Dark Blue, and Brothers listed in the “featured” section. But if you access Tubi TV from a server in London, you’ll see completely different films in the “featured” section, such as Bullet Boy, Zapped, Convict, and Pants on Fire. Similarly, connecting from a server in Ontario and browsing to the “featured” section will show you films like Walking Tall, Frozen, and Stan Helsing. This means that no matter which location you connect to the site from, you will not have access to the full catalog of Tubi TV titles. Despite this limitation, you can still access the full catalog by using a VPN. Here’s how to do so with IPVanish. Other VPNs will require similar steps. After subscribing to the service, download the software and install it on your device. Here’s general information on how to install a VPN on Kodi, and here’s how to install one on Amazon Fire, Nvidia Shield, and Roku. From the list of servers, click one that is in the country you want to access the site from. If you want to access the site from the U.K., for example, click a server in London, Glasgow, Liverpool, or wherever. If you receive a prompt asking you to verify that you really want to disconnect from your current server and connect to the new one, click “yes.” If you receive a prompt telling you that a “tap” must be downloaded before you can connect, click “OK” or “Yes” to download the tap, then click the server again when it finishes. 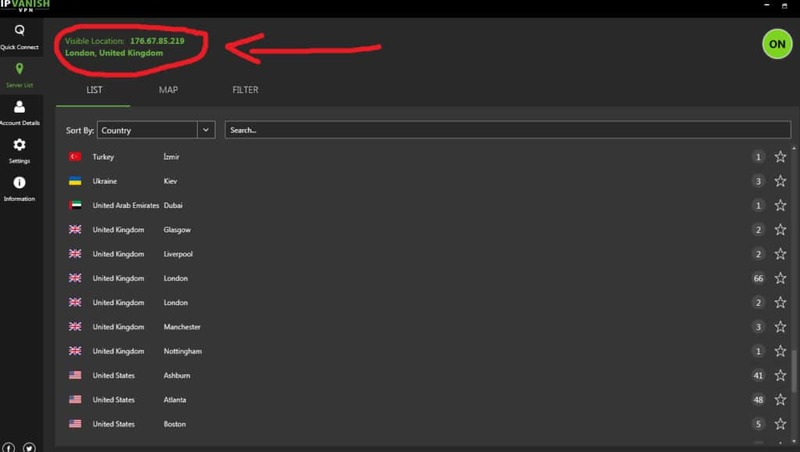 Wait for the “connecting” screen to finish, then wait for the “visible location” in the upper-left corner to show that you are now connected to the new server. Navigate to the Tubi TV addon from your Kodi and open whatever menu you want (featured, sci-fi, horror, etc.) Titles from the new country will appear in the menu. Paid streaming-video sites can provide a lot of popular, highly-rated content. But many don’t realize similar content is available for free. Tubi TV is one of the places you can find a massive amount of popular movies and shows without paying a dime. Follow this guide to install and use it.